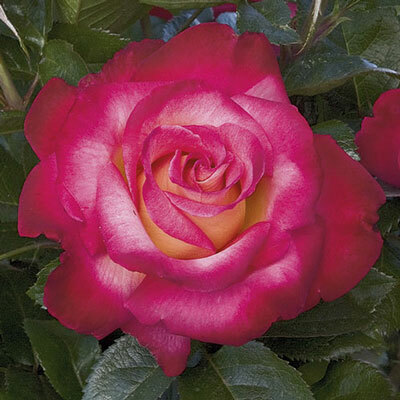 Black-red buds spiral open to show off swirls of cream edged & washed with vibrant cherry pink. But that's not the end of the exhibit on these classically-formed fragrant flowers. When the sun strikes the petals, they begin to blush burgundy, finishing as a deep dark red. Put all this color against super-shiny-green foliage with nice long cutting stems and you've got a killer combo. Easy to grow & great vigor. Largest flower size in cooler temps.